WESTLAND, MI. Chicago's dominance on both sides of the ball secured another win as the Force beat the Detroit Dark Angels 67 to 0 to improve their record to 2-0. 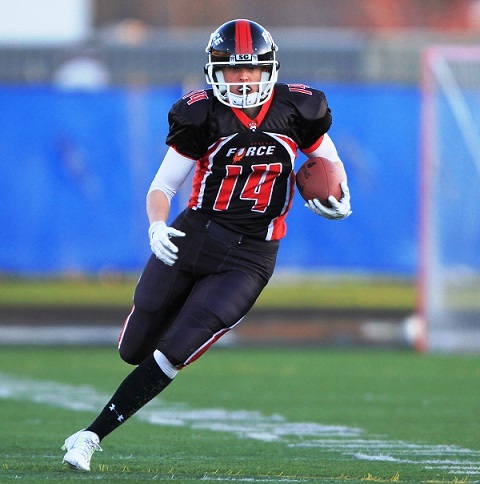 Running back Cassey Brick led an unstoppable rushing attack that put up 24 points during the first quarter, quickly diminishing the Dark Angels’ hope of a comeback. Brick was just 19 yards shy of breaking 200 yards from scrimmage, finishing up with 181 yards and 14 points. Quarterback Rachel Gore was equally impressive rushing and passing for a total of 281 yards. 136 of those came as part of the Force rushing attack. She frequently confused defenders with outside and inside runs as part of an almost perfect read-zone scheme. Gore ended the day with 3 touchdowns on the ground and one through the air, passing for 146 yards and 1 touchdown. Elisha Okrey completed the trio of 100+ yard rushers with 128 yards rushing and 145 total yards. All rushers had great success through the middle causing Detroit's defenders to miss tackles. While the Dark Angels made several attempts to get going on the offensive side, Chicago's defense was not going to allow points. Defensive Coordinator Mario Coleman's squad only allowed 38 total passing yards and kept Detroit's rushing attack in the negative with -7 yards on the day. The Dark Angels also caught a bad break when their starting quarterback Nicole Beier was hit hard on a running play mid second quarter. She was replaced by rookie quarterback Kayla Elder, who could not lead her team back. The win in Detroit marked the second time that Chicago's defense did not allow their opponent score. Chicago's special teams squad also came through forcing two fumbles and not leaving Detroit room to run. Head Coach John Konecki was pleased with the way his team played, noting "We played well tonight but I really impressed upon the team that they cannot be satisfied with progress because when they are, progress stops." Chicago is now leading the Great Lakes Division in the Northeast region before facing the Minnesota Machine next Saturday on their second consecutive road trip. The Force return home for a divisional matchup with the Indy Crash on May 9th at Lane Stadium.